A monitoring and evaluation (M&E) plan describes how the whole M&E system for the program works. This includes the indicators, who is responsible for collecting them, what forms and tools will be used, and how the data will flow through the organisation. You can think of an M&E plan as being like an M&E framework on steroids. For most small to medium size programs a basic M&E framework will be enough. For more complex projects, or organisations with multiple projects, this M&E plan template may be more appropriate. You need to describe the whole monitoring and evaluation system that will be used to measure the success of a large or complex project. Update: This article has been updated to include a template for multiple projects. 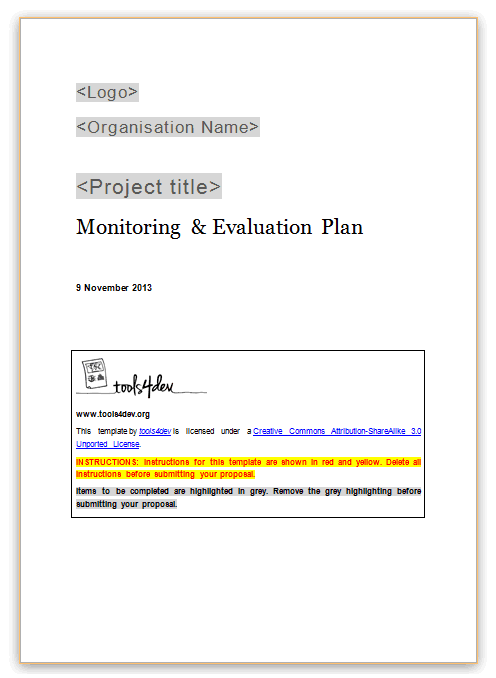 The M&E plan template by tools4dev is licensed under a Creative Commons Attribution-ShareAlike 3.0 Unported License. All other content is © tools4dev.